When I started working with computers, the preferred method of reading, studying and evaluating source code was to print the listing on your dot matrix printer and head to the lake with a pencil. 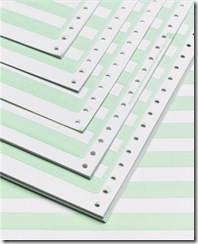 The alternating row color made it easy to follow longer lines. When looking at code where subsequent lines were mostly identical, this “feature” of the printing paper saved a lot of time. As dot matrix and line printers went the way of the dinosaurs so did this type of paper. Today we don’t really print source that often anymore. A recent survey showed that only roughly 22% of our users still print source code. 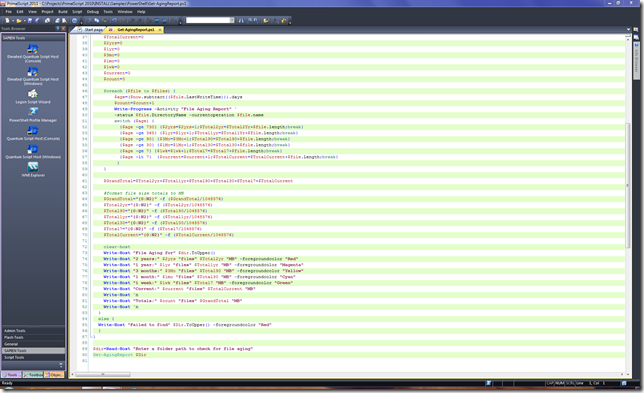 However, the feature of alternating colored line backgrounds makes a comeback in PrimalScript 2011. As screen sizes and resolutions increase you see a lot more code on the screen at the same time. The same readability issue with long and very similar lines applies to the screen as it did to paper. We all have slipped up or down a line by accident when studying code, specially if we read someone else’s code. You can tell we tried to capture the nostalgic green background from the paper ancestor, but don’t worry, the color can be changed, the entire feature is optional and (so far) initially switched off. This is the first of a series of blog posts on the next version of PrimalScript. Please use the comments to voice your opinion on any particular feature posted here. I like this idea! I also like a ‘current line’ type of highlighting. It makes it easier to keep track of the cursor. That’s already there. Tools – Options – Text Editor – General: Highlight current line. Not that the hardcopy typically switched colors every 3rd line. That would look less cluttered I, think. That said; I’m on the fence as to the usefulness.